At the SFMTA meeting today, big boss Nathaniel Ford has stated rail service for the M-Ocean View and K-Ingleside lines is estimated to return on September 4, 2010. As you may recall, the St. Francis Circle rail project has forced Muni metro to use bus shuttles between West Portal Station and Balboa Park Station for both the M and K lines. The M-rail line has been temporarily suspended, the K line now terminates at 14th Avenue and West Portal, and L-Taraval trains are running on a more frequent basis with two car trains running everyday. This project has run into some controversy. 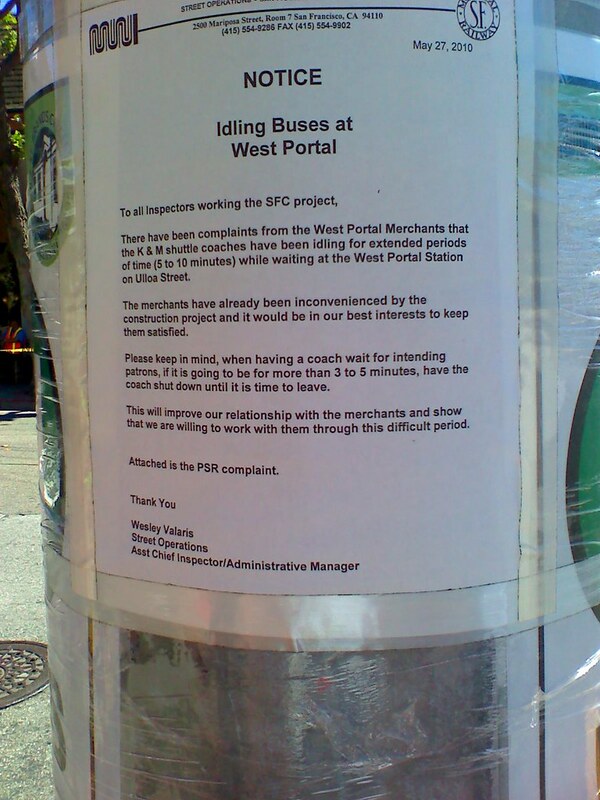 For example, the photo I've provided states that Muni has been in trouble with residents and business owners over the buses idling with their engines on at West Portal for long periods of time. As a general rule for terminal stops, motorized vehicles must have their engines shut-off while waiting for their next run. If you have ever driven across St. Francis Circle during the construction, the temporary driving configuration around the track project is really confusing, and I almost feared getting my car hit with the sharp left turn needed to go onto Portola. Since the project end date is September 4th, just imagine riding the M-Ocean View or K-Ingleside shuttles while school and college is in session. That's right, get ready to enjoy your bus shuttle ride full of school children, SF State students, and City College folks when it reaches mid-August.